Basel`s University Hospital was founded in 1842. 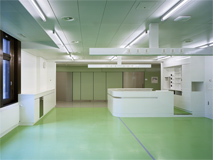 Clinic 1 was built by the architectural firm H. Baur, E.+P. Vischer and Bräuning Leu Dürig between 1939 and 1945 to replace earlier buildings. Consisting of a block of in-patient rooms and an adjoining treatment wing, it featured Modernist design principles. In fact, thanks to its clear functional organization, its architectural quality, and its inviting atmosphere, Clinic 1 was viewed as a perfect example of Modernism. Between 1986 and 2003 Clinic 1 was fully refurbished in stages and a new surgery unit and maternity wing added, without any interruption to the hospital?s routine. The intervention was kept as low-key as possible to preserve the 1940s Swiss ?Heimat? style of the existing fabric. The extension is an independent architectural component that harmonizes with the older building. The same basic design principles were adopted ? for example the architectural order, the non-structural facade in front of the column grid, and the courtyard typology. To maximize the size of the column-free spaces, the structure and vertical technical shafts are arranged in a square around an interior atrium. The outermost column zone, arranged on a tight grid and fronted by a fully glazed elevation, serves as a filter and a transitional zone between indoors and outdoors, and between private and public space. The double facade and the printed glass provide privacy and protection against the sun and glare. Aside from the desire to develop new typologies for the gynecological outpatient, surgical and obstetrics departments, considerable importance was attached to natural lighting in all areas and circulation zones. Patients' access routes run along the outer facade and in some places serve as communal and communication zones; the inner courtyard/atrium admits natural light down to the first floor. Each floor of the seemingly rigid square building can be configured differently, providing a flexibility of use that would not otherwise be expected in such structures.